The 2nd Annual Oakland Internet Cat Video Festival took place a little over a week ago. Large numbers of cat lovers and cat-video enthusiasts descended on a block of West Grand Avenue along The Great Wall in celebration of cats, and of course your author was there, complete with crazy-cat-lady dress and bag. The daytime part of the event had more of a street fair atmosphere, with numerous booths providing food and miscellaneous cat-themed products under a bright but cloudy sky. There were also numerous organizations involved in fostering and adoption of cats, including the East Bay SPCA (one of the main beneficiaries of the event) Cat Town, and Oakland-based group that finds foster and forever homes for local cats and is also opening what may be the first cat cafe in the United States! Many of the organizations brought adoptable cats and kittens for viewing. We certainly hope some found homes that day. The celebrity rock star of the event was Li’l Bub, who was on hand for visitors to meet. Our friend Serena Toxicat of Protea performed a feline-themed set of music for voice and electronics. Among her songs was a tribute to the manual (or Pallas Cat) with the warning not to get too close to one despite its awesomeness. Other daylight fun included a photo booth from the makers of 9lives cat food, inviting visitors to Instagram and tag themselves as #MorrisAndMe (and of course #catvidfest). Finally, the sun set and the actual videos began. The videos were from a curated reel featured at the Minneapolis Cat Video Festival hosted at the Walker Art Center., and featured many familiar videos such as Henri the existential cat and Grumpy Cat, but also new discoveries. What makes this experience unique is not the videos themselves, which so many of us know from our time on the Internet, but the act of getting together and watching them with others, and laughing together at the cat antics. I am certainly looking forward to this event coming back again next year! One of our favorite holiday traditions here in San Francisco is the window display at Macy’s flagship Union Square store featuring adoptable pets from the San Francisco SPCA. They always get a good response from the public including numerous adoptions, which is of course what this event is all about. And we at CatSynth love seeing cats finding new homes. You can find out more about the program at the SF SPCA’s website, including visiting hours and how to donate to help the city’s homeless pets. And if you live here or you’re visiting SF this holiday season, go downtown and see the cats in person! Each year, the San Francisco SPCA teams up with Macy’s in San Francisco to feature adoptable pets in the holiday window displays at their main store in Union Square. And we at CatSynth present some of the cats that are featured in the windows and available for adoption. The windows featured a theme this year that appeared to me as a series of gears and old machinery. It turns out that the theme is in fact “Make a Wish” and the machinery represents a “wish factory”. Clearly the wishes here are for loving homes for all the adoptable animals. The program is always popular with visitors to busy Union Square. And it has been quite successful, placing many animals in homes and raising funds for the San Francisco SPCA’s many other programs. The holiday windows continue through January 1, with different animals rotating through each day. If you are in San Francisco this holiday season, I encourage you to check it out. Those who aren’t going to be in the area can still enjoy the displays via the live video feeds. You can find out more about Macy’s SF SPCA Holiday Windows at this website, including hours, volunteer opportunities, and donation information. Weekend Cat Blogging #341 is hosted by Billy Sweetfeets Gingersnap. The Carnival of the Cats will be hosted this Sunday by the always hard-working Nikita and Elivra at Meowsings of an Opinionated Pussycat. Every year during the holidays, San Francisco SPCA teams up with Macy’s in San Francisco to feature adoptable pets in the holiday window displays at their main store in Union Square. For Weekend Cat Blogging, we at CatSynth present some of the cats that are featured in the windows and available for adoption. The black kitten wanted to play and “make friends”, alternately batting and grooming the other one, who seemed to have no interest whatsoever. A similar scene ensued with the two older cats below the bridge, where the darker one came over and started enthusiastically grooming the lighter cat, who was less than enthusiastic about this. Nonetheless, all the antics provided an added dimension to the visit. The SF SPCA is of course welcoming donations to support this program and all its other efforts. Weekend Cat Blogging #289 is hosted by the tireless Nikita Cat at Meowsings of an Opinionated Pussycat. The Carnival of the Cats will up on Sunday at When Cats Attack! This weekend, we present some of the cats featured in the Macy’s SF/SPCA Holiday Windows. Every year during the holidays, San Francisco SPCA teams up with Macy’s in San Francisco to feature adoptable pets in the holiday window displays at their main store in Union Square. Many passers-by in this busy shopping district were surprised and delighted by the live animals in the displays. We at CatSynth certainly hope that some of these animals, including the cats featured above, find new homes as a result of this program. To find out more about the program, including when to see the animals and how you can contribute, please visit the official Macy’s SF/SPCA Holiday Windows site. 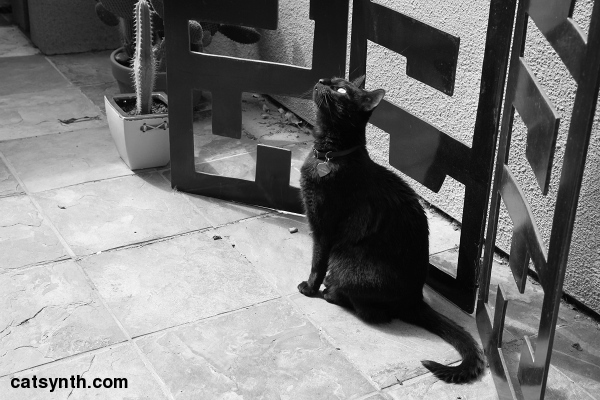 Weekend Cat Blogging #238 will be hosted by our friends at the House of the (Mostly) Black Cats. Carnival of the Cats will be going up this Sunday at When Cats Attack!. No, this is not Luna. This black cat, featured in a holiday window display at Macy’s in San Francisco, did bear a strong resemblance. Macy’s and the San Francisco SPCA have a longstanding program that features adoptable animals (cats and dogs) in the store’s holiday window displays. You can find more info at the San Francisco SPCA site.